The Florida Georgia line history entails the history of two different individuals who are members of the group. The Florida Georgia line is a group of two individuals that have been making music together for a long period of time as one. 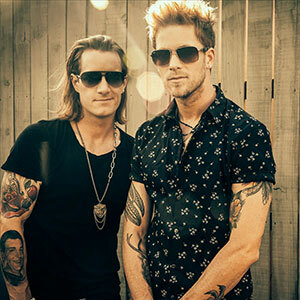 The group consists of two awesome singers; Brian Kelley and Tyler Hubbard who came together to form the awesome duo group in the year 2010 and they began as a cover band. The two Florida Georgia line members first had an interest in music in the church, that is, they had their history in the church before going into the country music genre. Brian Kelley who dropped out of the baseball team after discovering that he had no future in the game if baseball went to learn how to play the guitar while Tyler Hubbard was a church worship leader during his young age before he went further to create a Hip Hop group referred to as the Ingenious circuit. The guys met in the Belmont University in 2008 at a church worship service during their school days. Upon graduation, the two decided to take a lifetime risk of becoming great singers while they work to pay odd jobs while they sing in clubs during weekends. They had their first song record in the year 2010 which was named "Anything Like Me" and this brought them to the light of an individual who was ready to give them a helping hand. The duo singers; Tyler Hubbard and Brian Kelley are individuals with almost similar history although it was not really the same. The two singers were lovers of music right from their young age although Brian Kelley had an interest in baseball, he had to quit when he discovered that there was nothing for him in that aspect of life. Tyler Hubbard who was a native of Monroe, Georgia was a lead singer while he was in church so he had a very awesome interest in music right from start. However, after Brian Kelley left baseball, he learned how to play the guitar and he took interest in the Christian rock music and this was how the history of the Florida Georgia Line history started. The two later came together lived together and produced their music together before they were discovered by a talent hunt who was the Nickelback producer and they began going to the studio together from time to time to record songs. After the Florida Georgia line members were discovered by the Nickelback producer, they recorded their first EP song, "Anything Like Me" with Wesley Walker and that was the beginning of their success story. Some of the songs released by the duo were "You're Country", "Now That She's Gone", "Man I Am Today", "Never Let Her Go" and others. They later released their first song with Joey Moi in the year 2012 and currently, they are on their music history named "Can't Say I Ain't Country". Some Florida Georgia line facts includes the fact that the two of them are interested in philanthropy activities and they are involved in some activists actionst against hunger in America which was one of their success as a group. The two are married and they are doing well and fine in their homes. They have won CMT Music Awards, CMA Awards, American Music Awards, Billboard Music Awards, Teen Choice Awards, Canadian Country Music Association Awards and lots more. The duo has made history and has achieved a lot both at home and abroad.